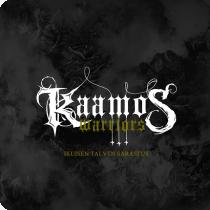 “Kaamos Warriors,” is an interesting opener, brutal and dark, it leads the way through differentiating patterns and rhythms. “Talventouja,” is another battering ram to the face. “Winter Eternal,” is a slow build, bringing with it some interesting ducks and changes, slowly venturing this way and that, whilst never quite bringing something proper. “Aaveet,” a pounding rocker. “Immortals,” another sharp wrenching number that produces a great number of climaxes and thrills. “Tyhyjys,” an interesting number venturing this way and that on the board. “Secrets of Stars,” a melodic pounding number. “Ikuisen,” a fitting closer, dark and melodic, with added edge. The album is out on February 15th via Inverse Records.